Chef Michael DiBuono is Executive Chef/Owner of Sea Level Oyster House in Cleveland, Mississippi. He is an avid supporter of Wild American Shrimp through social media and representing Wild American Shrimp in culinary competitions in which he competes, such as the World Seafood Championship. He recently opened his restaurant, Sea Level Oyster House in Fall 2018. 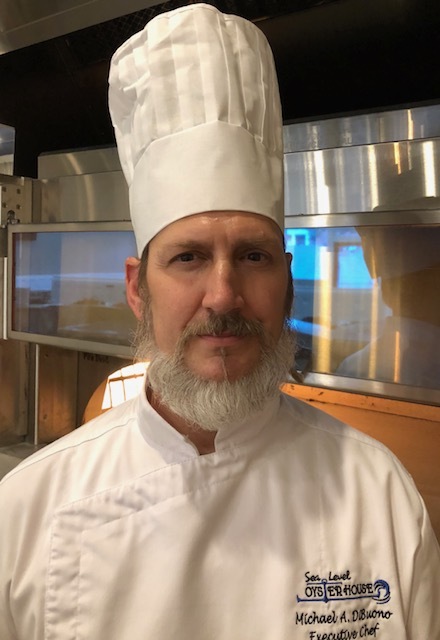 DiBuono regularly posts informational and supportive content advocating for the benefits of wild-caught shrimp on social media and repeatedly shows support for Wild American Shrimp in interviews along with visiting other restaurants and working with other culinary professionals to learn more about the industry. Chef Michael is self-taught with over 20 years in the industry ranging from Miami, Florida to Madisonville, Louisiana. He draws inspiration from his childhood with influences from the Caribbean and Latin countries – the food must be fresh, ingredients sourced locally, and must taste good! DiBuono was part of the Layers of Flavor team in the World Food Championship and competed in 2017 in the Seafood category with defending champion Chef James Aptakin. He is involved in several charitable organizations including St. Jude Children’s Hospital, Make-A-Wish Foundation and mentoring programs for aspiring young chefs. He is currently mentoring a young man by the name of Adrian Avelar as a part of Make-A-Wish Foundation who is a survivor of Leukemia and whose dream is to become a Chef. Chef DiBuono is a strong supporter of all things Wild American Shrimp along with locally sourced ingredients which makes him a Chef of the Year 2018 Finalist. Learn more about Chef Michael DiBuono here.